I never wanted to be president of the U.S. I never had any interest in politics - ironic, given my poli sci and international studies degree. Clearly, the degree my mother picked out for me. 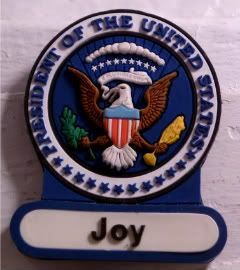 But, ya'll know I love my name, and that's how I ended up with this magnet, which I think I bought at the now-closed Presidents Park in Williamsburg, VA. Or, maybe one of the many presidential libraries I've gone to over the years? This magnet reminds me of my mother, because after many, many hours on the road back and forth to Boston, she picked out the Hannah Montana CD, and says, "Let's play this. I like that she says, 'who says, who says, I won't be president.'" Yep, Mom's a Hannah fan. Apple doesn't fall far from the tree, I guess.